Do You Want to Grow your List? You do have a list – don't you ? Having an email list is at the core of any multi million dollar business. It is also the heart of any new or growing business. The day you should start to grow your list is the very first day and if you haven’t done this already then today is the day to start. Why am I so dogmatic about this? Well because we learnt the hard way. We could have saved ourselves an incredible amount of time and money if we had known and followed these 3 simple steps. The same steps, to grow your list, that I am going to lay out for you now – hindsight and knowledge are wonderful things! Essentially to grow your list you need to get your prospects to opt-in and give you their email address. It really is as simple as that! This is the basis for all lead generation. So why are emails so important? account gets shut down or worse still but probably more likely it gets hacked – then what? Plus as we all know on any social media platform you are only able to connect and engage with a very small % of your people at any one time. And you are relying on someone else's platform. You do not have proprietary rights, the social media platform does. Two – Think about it this way for a minute – How many emails do you get a day 100 200 400? Now how many social media posts, tweets, pins, fly though your walls every hour? Literally thousands, so where will you have more chance being seen and heard – yes through your emails. Three – Add these four facts into the email mix. 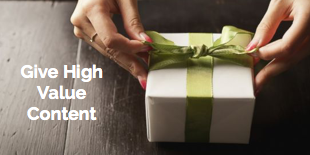 2 – 44% of email recipients made one purchase or more last year based on a promotional email. Four – Your emails – your list is a valuable commodity in its own right and needs to be cultivated and cherished. 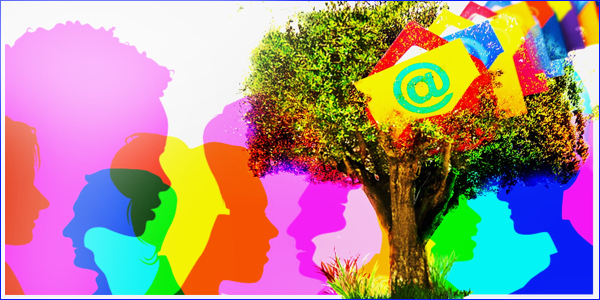 Behind each email address there is a person, these are your people and they are the lifeblood of your company and its future. Ok you get the point - and Yes I am passionate about the importance of having a list. Build your list now and continue growing your list and never stop. Your list is one of your most valuable assets. I want to add here one Very Important Point. It is imperative to grow your list and have lead generation in all businesses. But, going out and buying a list is to put it bluntly foolish or as Derek Halpern (Social Triggers) said “just plain stupid”. Going out and buying a list is NOT advisable – don’t do it. You will end up with a list of emails that will most likely have nothing to do with what you do or who you are. They are often old and out of date emails and when used you may well end up with Spam complaints which will culminate with you blacklisted by your email server or with a score so low that your CRM will not deliver most of your emails into others inbox. Warning over…. 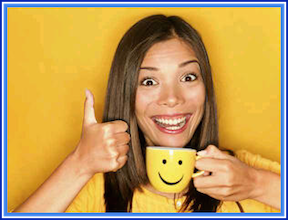 So what where the 3 steps I wish I had implemented sooner?….. Simple? – Yes it is. You can have this system up and running in no time. So lets go through each step and how they all tie together to grow your list, create your list building funnel and get you generating leads. Traffic, you need traffic, generating traffic is an essential part of building your list and getting those all important emails. 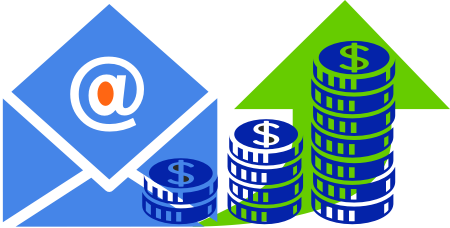 There are two types of Traffic – Organic and Paid. Organic traffic is traffic that comes to your site through your content, through referral traffic, back-links, your social media presence or even through direct contact. For instance you have a shop or meet people at a seminar. Either way it is traffic that has found you. This type of traffic can take longer to obtain and it's Free. Paid traffic well that is exactly as it sounds. You have paid for adverts, either Google ad-words or through social media – Facebook ads for example, so that people click on these ads and are automatically directed to your site. Web site owners can use Google Adwords and pay to have their Web pages display for certain keywords. When someone runs a search query containing those keywords, their pages will show up normally high up on page one. the exact ranking will depend on competitiveness of keyword and Ad spend. 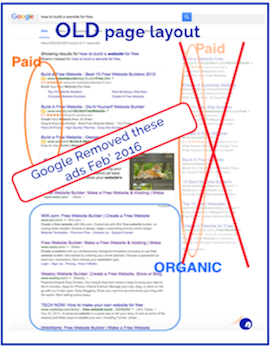 One of the simplest ways to see the difference between Organic and Paid is to type a search into Google. On the search results page (serp), you can tell paid results from organic ones because search engines set apart the paid listings, putting them above or until recently to the right of the organic results and giving them a different layout as visual clues. Below are images that show the difference between paid and Organic. 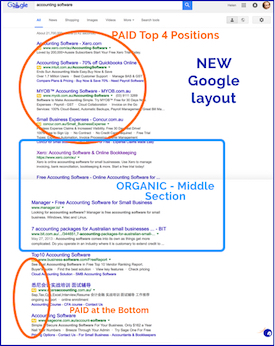 To the right you will see Googles layout until a few weeks back, to the Left is the new layout, you can clearly see that they have removed the right-hand side column of Ads – I wonder what that has done to Google's revenue! Interestingly one major reason for this change and a factor we should all be taking into consideration is the massive increase in mobile usage. Mobile for internet access has overtaken desktop and in some industries accounts for up to 80% of users. Googles right hand ads did not show up on mobile in the same format, hence the change. In short Organic traffic takes longer to obtain, but it is free. 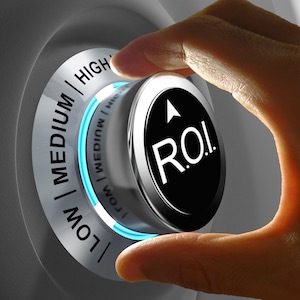 Paid traffic means instant traffic but costs. I concentrate on paid traffic as the traffic source in The Ultimate List Building Funnel, because it brings instantaneous results. However I show a great way to get these leads at Cost or no cost by adding a tripwire, more of that later so keep an eye open! Why is this so exciting? Well- this ONE page is your conversion tool, by getting just this one page right you will be able to convert a visitor into a lead with an opt-in or convert a lead into a customer/client with a sale. This one page is your ‘shop window’, your ‘product page’, it is your fast way to engage and convert. These pages are now very easy to set up and can even be done if you do not have a website – yes you could set this whole system up and get building your list or database whilst you are still creating your website. Landing Pages in my opinion are the most important pages on your website and are mandatory to grow your list. Landing pages are vitally important. They are the conversion tool that will get you the emails or sales, they will become the most important pages on your website. I do strongly recommend that you create a website, if you have not already. However I am sure that most reading this will have had their websites for some time. 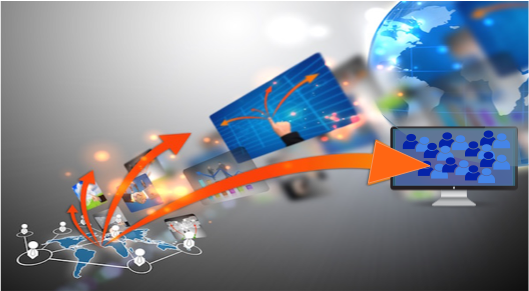 It is through these landing pages that you will ultimately increase your ROI and generate revenue. So let’s talk a bit more about landing pages, what they are, why you need them and the crucial parts to include on any landing page. A landing page is a page where traffic lands. It is a web page, that you have directed traffic to so that visitors Land Specifically On that Page and it is designed to get a prospect to take a further action with you. It is a page that allows you to capture visitors information. It is NOT your home page. These pages are designrd and constructed with one purpose in mind, to get the visitor to take the next action with you as directed on the page. For all my techie/analytics friends – ‘Landing Page' in Google Analytics means something different – it's the very 1st page landed on when a visitor comes to your website. 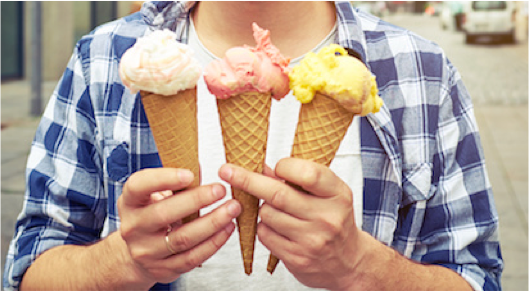 A squeeze page is a landing page designed around one single, specific outcome. In our case here, to grow your list, the goal is to obtain the visitors email. Your landing page should convince, cajole or “squeeze” a visitor to opt-in providing their name and email. Give that visitor a Nudge to opt-in! Naturally the ultimate goal would be to have any visitor to your website purchase immediately, this is actually even rarer than you think. Statistically 98% of visitors to your site aren’t ready to buy and only 2% will remain on your site longer than 10 seconds. On average new leads need between 7 and 11 touch points, little nudges to feel comfortable in becoming a lead and hopefully a customer. It’s one of the prime reasons why you need landing pages. Here are some other reasons why you need landing pages? So you can create highly optimised pages without the need for a web designer. To obtain additional data such as where your visitor has come from and what device they are using. 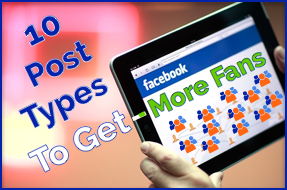 So you can target different audiences with different targeted content. Because they can be linked from almost anywhere and can be integrated easily into your customer relationship manager (CRM). They are a sharper and quicker path to an opt-in or sale. They are very cost effective and there is no limit to the number giving limitless opportunities to create more leads. To be effective there are various fields that must be included on any landing page. The two most important parts of any landing page are the Headline and the CTA (Call to Action). I can't stress enough that a strong impactful headline and eye catching call to action button are paramount. Did it Catch your Eye? Yes I hope so and whilst this one may be a ‘little over the top' you can see how important it is on a landing page to get your visitors attention quickly. Your Headline should instantly grab your visitors attention and the Call To Action button should tell them the next action to take. Ideally as soon as your visitor lands on your landing page they will find exactly what they are looking for and will be keen and willing to take that next step with you . You need to convey what you are offering, why they would love to receive your offer, why they need it now and how they can get the offer. To achieve this you must…. In this case, our goal is to obtain an email opt-in. One goal only for each landing page. Style the page to fit your ideal customer or client. Ensure the page resonates with your customer persona or avatar. Clearly and precisely list the features and benefits of what you are offering. Hit emotional pain and pleasure points. Why they need your product or service and how having it will change their lives. The features would be examples of what is in it. As an example, in the lead magnet below (16 point checklist) the features would be that it has a checklist, that the points are actionable, valuable and can be implemented easily following the 16 steps. Then add in the benefits which are the emotional reasons why you would spend time taking the next step. For instance again using the lead magnet below the benefits would be you get a stress free, easy and quick way to get a truck load of leads. Takes the pressure off, no more waiting for the next client or customer. To be able to grow your list and generate new leads, you will need to offer them something of value first. If you are asking a visitor, potentially someone new – or cold as we call them – to give you something (their email), then give them value first. You could offer them a Lead Magnet (LM) which is designed to get the lead. Or you could offer them a Money Magnet (MM) which is designed to get the sale. 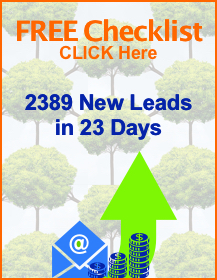 A Lead Magnet could be something like a free checklist (like the one above) or tip sheet, a free guide or a white paper, a free video or mp3, a case study or maybe even a free ebook. Your Lead Magnet needs to be of great value and low risk. Lead Magnets are used to grow your list and in your list building funnels to obtain the opt-in. 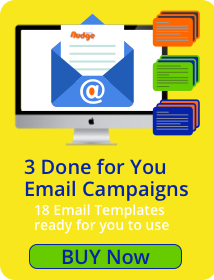 Your singular goal is to obtain their email address. Don’t hold back give them some of your best stuff, genuine authentic and top notch and make it low risk. And please don’t think – I am only asking for an email so it doesn’t need to be much – Yes it does – your credibility and business success are at stake! After all people will only come back if the content is good and valuable. I am not talking about Quantity here, I am talking about Quality. Ideally your Lead Magnet should be, easily consumable without taking too much of their time and great value that gives them an instant result. With a Money Magnet you are also offering something of value and in return expecting them to either, buy from you or commit to a higher risk activity such as a webinar or a 1 : 1 call. Higher risk because they are investing their money and/or time. For your sales funnel you will also need a Money Magnet – examples would be a video tutorial series, a course, some 1 on 1 tuition, a webinar or an action plan. Imagine a Money Magnet is a Lead Magnet on steroids! If you are charging for something it would need to be a more major piece of content. Again tremendous value is most important. I am often asked, well isn’t your Money Magnet your product or service? No it is not. I would suggest that it is a small part of your main product or service but as you will only be asking a very small price for this – normally below $50, maybe up to $97 but definitely below $100 – this is a nugget of your main product or service. One thing to remember – both the Lead Magnet and the Money Magnet are for you to be able to deliver high value content. The best Lead Magnet should cover a specific problem that your prospect has and will give them a clear solution to that problem so that they get an immediate result. 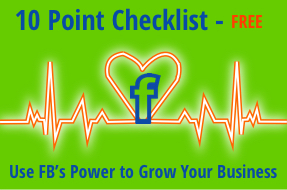 For an example of what I consider to be a great Lead Magnet, to grow your list – go to the top right of this page and you will see “The 16 point checklist that 4X our Leads” . The bonus is it is really much more than a list! Basically you can copy how it is done and generate a truck load of leads for little effort and no cost. Yes I am recommending one of my own Lead Magnets and my Landing Page. Why? Because this way I can tell you the exact conversion and opt-in rates and you get the benefit of a Lead Magnet and Landing Page that have been tweaked and optimised over time to achieve great results. Even if you have no interest in increasing your traffic and sales, but would like to see a landing page that is an effective email list builder – it is currently converting at 53% then check it out and swipe it, use it as a template for yourself to get great results – click here to access it – and let me know what results you achieve with your landing page. You can effectively build and grow your list with ease when you follow this proven 3 step system. Step One – Generate traffic, which can be done either organically (the slower way) or paid (a whole lot quicker!) Also with paid you have total control of the flow of traffic. Need to increase it you turn the tap up, want to slow the flow then you turn the tap down. Step Two – Create at least 1 landing page to send targeted traffic to. Then optimise that page, so that it converts well. Then build another, either for another section of your audience or to direct them to more content. Step Three – Have some content to give them that is high value and low risk in exchange for their name and email. I wish I could say it was harder than that but it’s not. By following this 3 step system you will grow your list. Cherish your list. Those emails belong to real people and they are interested in what you are offering. Once you are growing your list the next stage is to maximise the leads you get by optimising your landing pages. You can 4x and often 10x the opt-in rate with the correct optimisation. In the introduction to 16 point checklist that gave us 2839 New leads I give you a case study of optimisation and how it changed Sarah's sales. Getting an email opt-in is the first and major step to building a relationship, turning your prospects into leads and paying clients and customers. 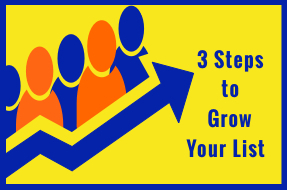 This is the way to grow your list in 3 easy steps.